Kelly and I met in Book Arts when we attended art school years ago. I always remembered her pieces for being subtle and thoughtfully brilliant. We crossed paths again in Chicago when she was showing her incredible fiber pieces at the gallery where I worked and at The Renegade Craft Fair. 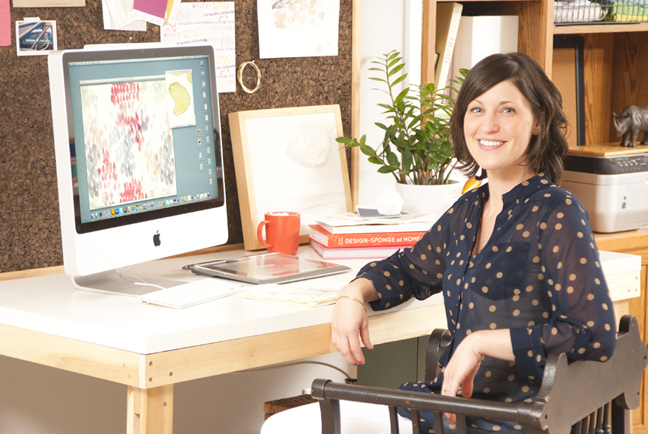 Now we're all back in the Ann Arbor area and Kelly is a full time product and surface designer. 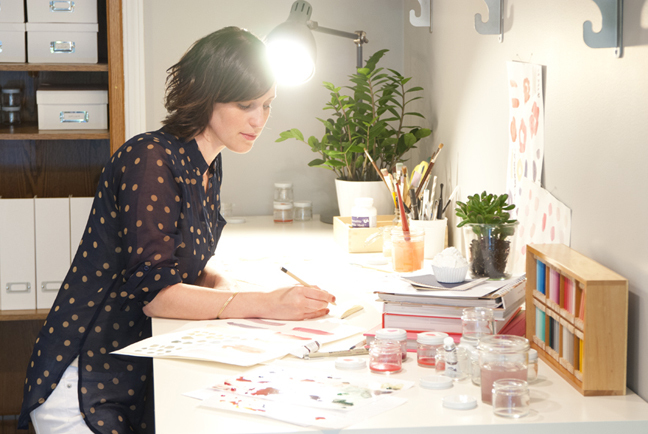 We were so thrilled to hear that a line of her illustrations had been picked up by Crate & Barrel to be reproduced for their Spring 2014 art print line. Congratulations, Kelly! N captured some great shots of her working in the studio in preparation to send to C&B for their artist profile. Kelly works largely in watercolor and pen. She has a beautiful signature style that's whimsical and saturated with color. See more of Kelly's work at KellyVentura.com and her Minted site. We can't wait for her collection to come out next spring - look out for it! Yesterday's post on pricing student or "emerging" art work tackled the difficulty of pricing your works to move. But maybe even more difficult is gaining the exposure and putting your works in the right venue to be seen and sell. When I was talking to Paula Shubatis about the value of large scale oil paintings, I was also considering the proper space for the pieces to be hung. She had a really great idea to have a non-profit sponsor so that she could apply for a permit to exhibit in an alley downtown. I immediately posed the question, "How will that make you money?" Yes, it would gain her intrigue and possibly some press, but I was concerned with how she was going to be rewarded for her efforts. Too many times we think about the work but we don't know how to translate to tangible values. Most of society is already programmed to consume art in small manageable pieces so while seeing a painting in an alley might be exciting, it might not speak to a buyer or get a buyer to come out to the alley to begin with. Paula answered that it probably wouldn't be a money-making ploy but the alley would complement her painting. Although it would be for a short time, I had to agree. So we started brainstorming on how she could further the visibility of her paintings and who her potential clients were. This is what I suggested researching. Although many have been dissolved over the years, corporate art collections were and still are a barometer of a corporations success. The historical, educational and sophistication level of a curator's choices can communicate a vast number of nuances to a client. Some focus on specific topics relevant to the company but most are diverse and worth millions of dollars. I suggested to Paula to research any collections that were still active in the southeast Michigan area and send a professional letter and images to those that collect contemporary. From creating enough inventory to sell to the logistics of travel to getting into the fair itself, the career of a professional artist is a tough one when you're traveling cross country to sell your wares. But I know some very successful artists that make a living of this and they love what they do. Research each market, figure your costs (including booth fees, lodging, food, airfare/gas, insurance, shipping if needed) and try out a local one to see if you like the art fair circuit culture. The art dealing culture has changed drastically over the last decade. Gone are the days of sending slides and lugging heavy portfolios to the gallery. While it may still stand as the pinnacle of an artist's I've made it moment, getting representation is getting harder and harder each day as galleries downsize and restructure what it is to be in a gallery's stable of artists. Now there are an infinite number of online galleries and stores to sell your work. Besides the ever popular Etsy, there's also Big Cartel, a foolproof store that handles your art sales and monetary transactions safely. If you are interested in going the traditional route of being represented by a dealer, read the instructions carefully and make sure you include everything they ask for and nothing they do not. Use the best materials you can afford and have friends or colleagues proof all text. Also, do not send unsolicited packages. I used to be an American art dealer (known impressionism, modern and contemporary works) and would receive numerous packets from artists. Had they taken the time to research the website, they would have seen that I generally worked with museums and collectors to sell paintings by deceased and market-established artists. Vet your galleries carefully and save yourself the postage! If nothing else, having a website is a must. Take clear, well-lit photos of your art work and make sure your site is easily navigable and concise. Include an artists statement and any information that will intrigue your clients. Branding yourself properly is probably the most important tool of all. Getting in front of a buyer is difficult without a dealer or gallery. That said, there are many perks to representing yourself, namely not having to pay a share to the middle man. But that means you have to know how to talk about your work and how to publicize it. I always tell students and artists to learn to write a press release. It's one page, has all the relevant information a magazine, newspaper or TV would need to cover your story. But make sure it's newsworthy before you send it. It's also important to make rounds at the art fairs, openings and museum circuit. Learn not only to talk about your work but art and design history in general. There are tons of details that go into the success of an artist and these are just a few starter tips. Sometimes it's just a matter of knowing the right person, being at the right place at the right time...but I like to believe that forethought, planning and talent matter too. Good luck! Challenge: Point vs Pro | Why Do You Need A Professional Photographer Anyway? We've gotten a few photo shoots under our belt since the start of the company and we have to say, we're pretty happy with the results. From food to portraits, we've been able to offer a variety of takes on what the client wants while injecting our own flavor into things. Thing is, there's still some apprehension from time to time about what it is we do, why we do it and if it's truly that different than just picking up a camera and taking a point and shoot photo. The answer is "yes!" We don't strive for just good enough, we want exceptional. See for yourself. People may not always be able to voice what it is about the photo that doesn't seem quite right until they see a proper example of how it should be done. You're probably wondering what we shot with and why there's such a drastic difference. The shot on the left was taken with our trusty Nikon Coolpix S4100. It's a great camera for fun, social gatherings. But if you're a business owner wondering why your mailers aren't getting response or why you can't achieve the results as we did on the right, it's because we pack and bring an entire studio with us. Although a point and shoot camera is good for documentation it only offers one light source from a fixed point. For the professional shots, items were lit from the side with the assistance of white bounce cards to fill and highlight, making the item more robust. Every aspect of the shoot is in a controlled environment, much like the food campaign we shot a couple weeks ago. If you've ever wondered about professional photography, we're happy to answer your questions. Our ideas begin here. They're given life here. The keepers are then digitized. Lastly, they're printed on high quality archival photo paper in rich, saturated colors and sent to you. During college, I loved fashion illustration. I could draw circles, straight lines and do gestural drawings during life drawing class for hours. But as I progressed in my studies, I also began to feel more comfortable with computer software including Adobe Photoshop and InDesign, a desktop publishing program. After college, my poison of choice became Illustrator for all design, layout and illustration. Illustration is just as fun and colors are flattened yet bold hues. And I can still draw in my signature style. Digital is also great for creating sketches for clients. I still believe that it's incredibly important to be able to render a person in graphite so that you can apply the same rules for shadow and scale digitally. I haven't lost my drive to create, it just comes in a cleaner, brighter package. And that doesn't mean that I still don't get messy from time to time.